1:40 pm The masterful carving of Tene Waitere is revisited 70 years after this ingenious and entrepreneurial carver’s death in a book by Nicholas Thomas and photographer Mark Adams. 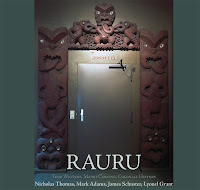 Rauru: Tene Waitere, Maori Carving, Colonial History is published by Otago University Press. 2:30pm Chapter and Verse: New poetry from Chris Price in The Blind Singer, and Singularity - from Montana New Zealand Book Award winning writer Charlotte Grimshaw. Is it a series of interlocked stories or a fractured novel?